Other Names: The Mississippi Mauler(Britain), Big Jim Harris, Bad News Harris, Sugar Bear Harris, Ugly Bear Harris, The Superfly(WCCW), Giant Kimala, Kimala, "The Ugandan Giant", "The Ugandan Headhunter"
- WCCW Wrestling Star Wars (August 15, '82) = The Superfly beat Brian Adias. - Mid-South Superdome Extravaganza (April 16, '83) = Kimala was pinned by Andre the Giant. - WCCW Wrestling Star Wars (June 17, '83) = Kimala won a "Handicap Loser Leaves Town" Match over Armand Hussein, Tola Yatsu, & Mike Bond. - WCCW Independence Day Star Wars (July 4, '83) = Kimala fought to a Double Disqualification with Bruiser Brody. - Mid-South Superdome Extravaganza (July 16, '83) = Kimala fell to Tommy Rich. - WCCW Labor Day Star Wars (September 5, '83) = Kimala lost a "Lumberjack" Match, via DQ, to Bruiser Brody. - Mid-South Superdome Extravaganza (November 19, '83) = Kimala lost, via Countout, to David von Erich. - WCCW Thanksgiving Star Wars (November 24, '83) = Kimala lost, via DQ, to the WCCW Texas Heavyweight Champion, David von Erich. - WCCW Christmas Star Wars (December 25, '83) = Kimala lost, via DQ, to Kerry von Erich. - WCCW January Star Wars (January 30, '84) = Kimala lost, via DQ, to the Junkyard Dog. - WCCW 1st Von Erich Memorial Parade of Champions (May 6, '84) = Kamala fought to a Double Disqualification with the Great Kabuki. - WCCW January Star Wars (January 28, '85) = Kimala lost, via DQ, to Kerry von Erich. - NWA/AWA Star Wars (February 24, '85) = Kamala won a "Handicap" Match over Lou Fabiano & Mark Pole. 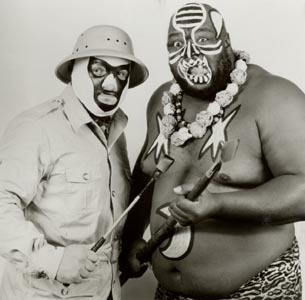 Later on, Kamala & Billy Robinson fought in a "Tag-Team Battle Royal", which was won by Sgt. Slaughter. - Mid-South Superdome Extravaganza (March 30, '85) = Kimala lost, via Countout, to the Mid-South North American Heavyweight Champion, Terry Taylor. - WCCW 2nd Von Erich Memorial Parade of Champions (May 5, '85) = Kamala lost, via DQ, to Terry Gordy. Later on, Kamala, Chris Adams, Gino Hernandez, Rip Oliver, Steve Williams, & the One Man Gang lost a "Two Ring Five Falls" Match to the Fabulous Freebirds & the Von Erichs (Kerry, Kevin, & Mike). - Mid-South Superdome Extravaganza (June 1, '85) = Kimala fought to a Double Disqualification with Jim Duggan. - NWA Great American Bash '85 (July 6) = Kamala lost, via DQ, to the NWA United States Heavyweight Champion, Magnum TA. - Mid-South Superdome Extravaganza (August 10, '85) = Kimala & Kareem Muhammad won a "Loser Leaves Town" Match over Jim Duggan & Bill Watts. - AWA SuperClash I (September 28, '85) = Kamala lost a "Body Slam" Match to Jerry Blackwell. - WCCW Thanksgiving Star Wars (November 28, '85) = Kimala fought to a Double Countout with the One Man Gang. - AWA WrestleRock (April 20, '86) = Kamala lost, via DQ, to the AWA Americas Heavyweight Champion, Sgt. Slaughter. - Mid-South Superdome Extravaganza (June 14, '86) = Kimala lost, via DQ, to the Missing Link. - WWF Saturday Night's Main Event #7 (September 13, '86) = Kamala took down Lanny Poffo. - WWF Saturday Night's Main Event #11 (April 28, '87) = Kamala pinned Jake Roberts. - WWF Paul Boesch Retirement Show (August 28, '87) = Kamala & Sika fell to Tony Atlas & the Junkyard Dog. - WWC 15th Anniversary Show (September 10, '88) = Kimala beat Jimmy Valiant. - USWA Night of Champions (March 2, '92) = Kimala lost, via Countout, to the USWA Unified Heavyweight Champion, Koko B. Ware. - WWF Summerslam '92 (August 28) = Kamala lost, via DQ, to the Undertaker. - WWF Survivor Series '92 (November 25) = Kamala lost a "Casket" Match to the Undertaker. - WWF UK Rampage '93 (April 11) = Kamala was beaten by Doink the Clown. 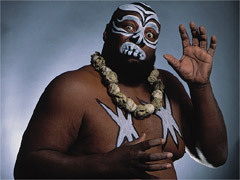 - WWF King of the Ring Tournament '93 (June) = Kamala lost in the first round to Mr. Hughes. Bret Hart won the tournament. - WCW Bash at the Beach '95 (July 16) = Kamala pinned Jim Duggan. - WCW Clash of the Champions XXXI (August 4, '95) = In a dark match, Kamala lost, via DQ, to Hulk Hogan. - WCW Fall Brawl '95 (September 17) = The Dungeon of Doom (Kamala, Meng, Shark, & Zodiac) lost a "War Games" Match to Hulk Hogan, Lex Luger, Randy Savage, & Sting. - WWF Wrestlemania X-7 (April 1, '01) = Kamala competed in the "Gimmick Battle Royal", which was won by the Iron Sheik. - IWC Heavyweight Title Tournament (July 20, '02) = In a Non-Tournament Match, Kamala fell to Jerry Lawler. - IWC Night of Legends (April 3, '04) = Kamala fought to a No-Contest with Jimmy Snuka. - Memphis Throwback Night I (July 10, '04) = Kamala & Cory Macklin fought to a No-Contest with Jerry Lawler & Jimmy Hart. - Memphis Throwback Night II (August 28, '04) = Kamala & Koko B. Ware defeated bill Dundee & Kevin White. - Wrestle Reunion I (January 25, '05) = Kamala fell to Jim Duggan. - IWC Winter Bash '05 (December 3) = Kamala was beaten by Jerry Lawler. - World Wrestling Legends (March 5, '06) = Kamala lost, via DQ, to Jake Roberts. - IWC Night of Legends '09 (March 28) = Kamala was beaten by Sgt. Slaughter. - RoH Supercard of Honor IV (April 3, '09) = Kamala fought to a No-Contest in a "Sweet 'n' Sour Challenge" Match with Bobby Dempsey.